Copies: British Library of Political and Economic Science: HD9540.8.G7 B94. Also Bristol and Durham university libraries (not seen). This Edition has been prepared in order to draw the attention of all those who are taking part in the present electioneering campaign to the injustice of these Dues so that the matter may be well ventilated. The space within the Blue Line is the Metropolitan Police area, within which the Duties are now and have been levied since 1861. The space within the Pink Line shows the area of the Metropolitan Board of Works and City. The old area of Taxation — the "Port of London" — commenced at Yantlet Creek near Gravesend: abolished about 1851. The space within the Purple line shows the area fixed in 1851: abolished in 1861 when the Blue Line was fixed. The space beyond the Pink Line and within the Blue Line is not represented at the Metropolitan Board, or City. These are depicted on a Stanford's base map showing roads, railways, county boundaries, etc. 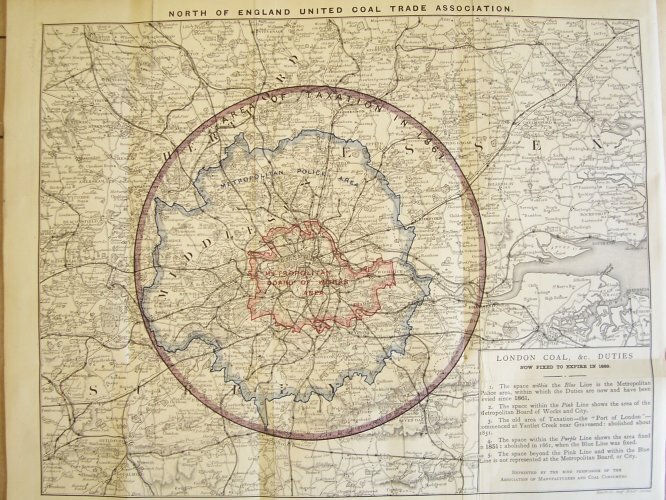 The name "North of England United Coal Trade Association" appears above the top border of the map and the legend states that it was "Reprinted by kind permission of the Association of Manufacturers and Coal Consumers". I have not traced this latter organisation -- doubtless a lobby group -- or discovered where the map was previously published.